This story is featured in the upcoming Spring 2019 edition of the HPU Magazine. 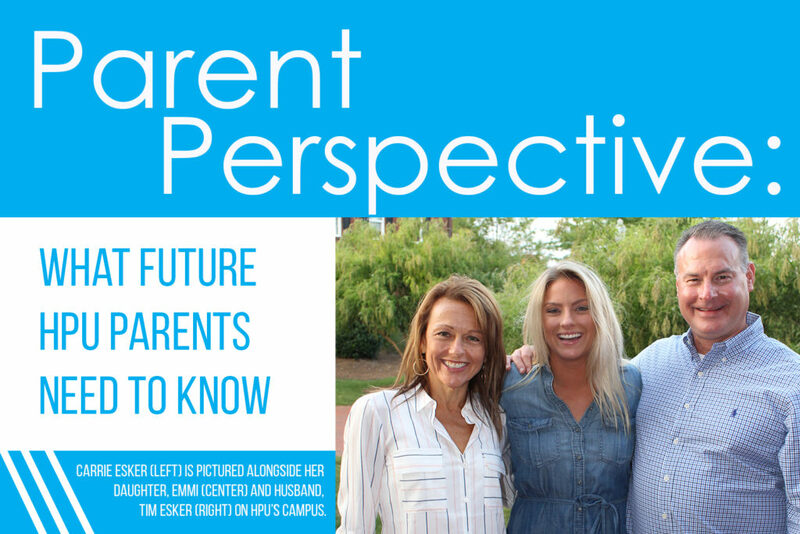 Discover below how a current university parent has experienced firsthand the opportunities that await students at HPU. College is a crucial time in a young adult’s life. What campus will be the best home for them? Who will be their mentors? How can they make the most of the next four years? And while high school students must consider these questions when choosing their school, HPU knows that parents are working alongside them, diligently searching for the same answers. Meet Carrie Esker, mother of Emmi Esker, a senior sales and marketing major from Cleveland, Ohio, who landed a full-time job at GE Healthcare months ahead of graduation. As an HPU student, Emmi was president of her class every year beginning her freshman year, served as a University Ambassador, chair of the Senior Class Giving Committee and was president of the HPU Professional Selling Club. Below, her mother reflects on her daughter’s HPU journey. Q: How did you and your daughter discover and choose HPU? A: Emmi’s first college visit was to HPU. A friend of mine called one day and told me everything that she’d heard about the university. That day, I watched every video and read every article I found on the HPU website. I was amazed. I knew it would fit Emmi and us as a family very well. So, we scheduled our visit. Emmie was in tears of excitement within 15 minutes. We canceled the other campus visits we had planned and headed back home to share what we’d found with Emmi’s dad. Emmi applied and was invited to Presidential Scholarship Weekend. Her father came with us for that special event and saw exactly what we’d been seeing. We were all on board. Q: What sets HPU apart from other colleges? A: Without question, it’s mentorship. For Emmi, it was Dr. Robert Hirth, professor of management. He interviewed her during Presidential Scholarship Weekend, and a week after she’d arrived to campus at the start of her freshman year, he connected with her. Emmi was in shock at the immediate mentorship. As her mother, I was excited and affirmed in my choice to support her decision to attend HPU. Dr. Hirth became the constant encouragement Emmi needed. He guided her through undergraduate research projects and saw her willingness to be pushed. 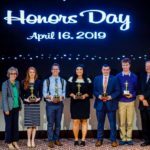 Dr. Hirth saw Emmi’s strengths and introduced her to HPU’s Professional Selling Club advisors Randy Moser, assistant professor of marketing, and Larry Quinn, chair of the department of marketing and sales. Dr. Hirth saw that she had grown in the area of sales and wanted to move her onto a track that would further her strengths. 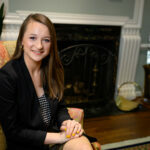 In her senior year, she became president of the HPU Professional Selling Club. My top goal was to see my daughter stretched. It requires professors working closely with students to see those gaps that need filling in. Q: How have you seen the impacts of an HPU education on Emmi? A: Last summer, Emmi interned with GE Healthcare thanks to Professor Moser and her experience with the HPU Professional Selling Program. It was a highly competitive internship, and when she arrived, she was surrounded by students from universities such as Caltech and Carnegie Mellon. The internship was part of GE’s sales program, so they wanted the technical skills. 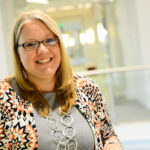 But, because of the life skills Emmi had gained at HPU, she stood out. During her first day, she kept track of business cards and names of people she met so that she could write thank you notes to them. The other college students hadn’t been taught to do that. More than technical capabilities, companies want people who can collaborate and communicate well with others. Because Emmi came from a premier life skills university, she knew how to handle herself. It’s what ultimately allowed her to turn her internship into a full-time position with GE Healthcare after graduation. She secured the position only months into her senior year. What’s better than that? Q: What do you tell parents and high school students who are considering HPU? A: There’s something very important about the uniqueness of this university. As her mom, of course I believe that Emmi is unique and that her journey at HPU and finding success is extraordinary. But her story at HPU is not rare – it’s possible for anyone. The opportunities that were available to Emmi are there for all students. As parents, we spend 18 years focusing on grounding our children in the values that we find important. It’s crucial to feel that your child’s college choice is only going to further that work. 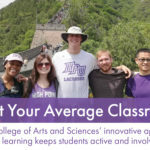 HPU is an investment that keeps on giving. Every resource to excel is there. Emmi is an example of going for it at HPU. If your student goes after it, they’ll have the support to make it happen.